On Thursday afternoon, the Pittsburgh Penguins made a minor league swap with the Columbus Blue Jackets. Paul Thompson, who had been struggling with the Pens this season, will report to the Springfield Falcons, while WBS will add forward Spencer Machacek to the lineup. Machacek has NHL experience with the former Atlanta Thrashers and the Winnipeg Jets, and he is also a veteran of nearly 400 AHL games. 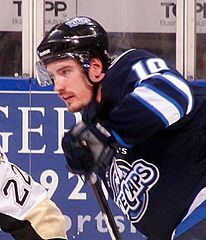 Machacek came to the Falcons in 2012-13 after being traded from the Jets organization, where he spent most of his time with the St. John’s IceCaps. He finished the season with 39 points in 75 games between the two teams, scoring 14 of those in 18 games with Springfield. While with the IceCaps, he was part of the 2011-12 squad that knocked the Penguins out of the Calder Cup Playoffs. That year, he had 50 points in the regular season for the second-best total of his career, and then he added seven assists in 11 playoff games. Prior to the trade with the Penguins, he was fourth on the Falcons with nine goals on the year. According to a scouting report on The Hockey News, Machacek “doesn’t know the word quit,” which will be an asset to a WBS team that has continued to win even in the face of frequent call-ups. He also has good NHL size at 6’1” and 200 pounds, so even if he doesn’t get called up, he will bring grit and physicality to the Pens. Machacek is also not afraid to drop the gloves, even against opponents who may be bigger and better fighters than him. Last season, he squared off with Bobby Robins of the Providence Bruins. Robins finished the season with 316 penalty minutes and already had 35 major penalties at the time of the fight. Machacek, meanwhile, only racked up 45 penalty minutes when the season was over with. He can hold his own in a fight against a wide range of opponents. However, Machacek tends to instigate fights. While it can be seen as sticking up for a teammate, like he did with Winnipeg when Tobias Enstrom was hit with a high stick, it could also lead to careless penalties and show that he may be looking for trouble more than he is looking to play. On another positive note, he has played in the Calder Cup Playoffs in three of the last four seasons and has 19 points in 40 games. The Pegnuins are currently fifth in the Eastern Conference and in a tight race with the Binghamton Senators for an East Division title, and if Machacek can keep up his hot pace from January (nine points in 10 games), he could make a difference down the stretch. “Anytime you have a chance to win a championship, no matter what league it’s in, it’s a tremendous honor and you don’t get them all the time.” Machacek said in an interview with Falcons broadcaster Mike Kelly last season. While this trade is not going to affect Pittsburgh, WBS can come out a winner if Machacek produces and stays out of trouble. He should excite the fans with his fights and also shows a willingness to work the puck down low. At first look, it seems like he is just about the same kind of player as Thompson, but he will need to keep the consistency and earn his spot in the lineup. The Penguins will have forwards such as Andrew Ebbett and Harry Zolnierczyk back in the lineup, and it will be a tough competition over two proven forwards who have gained NHL experience this season.